Finally, I’m getting around to writing about seeing The Simpsons Movie this weekend. It definitely lived up to the high expectations set by its television predecessor. The fact that it was basead on a TV show was brilliantly parodied in the opening bit. I loved the details they were able to plug into the more panoramic format. The mob scenes were a marvel as I kept trying to keep up with all the myriad familiar characters that streamed past the camera’s point of view. I also enjoyed the jabs at government that are so typical of the minds behind Bart and Homer. I loved that they were true to their characters’ original ideals. I do wish they’d spent a bit more time in Springfield so we could get more visits to Moe’s Tavern and encounters with Montgomery Burns and Milhouse and Patty and Selma. I did dig that Green Day was the celebrity rock and roll cameo. And even more so the creative use of Tom Hanks. Albert Brooks is always up to the task of doing great voice over work, matching the top talents of the original cast. I did find Lisa’s new friend was a bit of a “flat note”, if you will. Ahhhh, the wisdom of Homer. You can’t beat it with a stick. Of course, I have to point out the fact that one of my legion had a major role in carrying the plot forward. 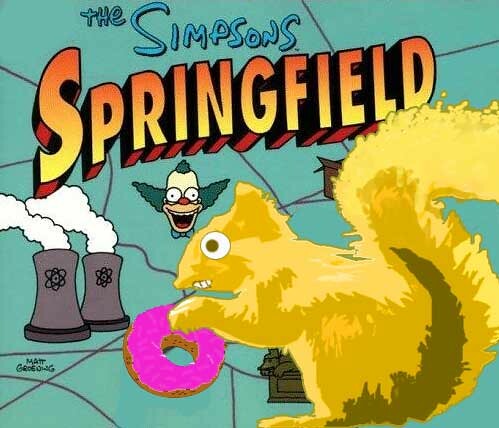 I didn’t know that when I created my Simpson squirrel in photoshop the other day. If I’d known ahead of time, it would have had many, many more eyes. And if you bump into me any time in the next few weeks, you’ll likely still hear me humming the “Spider Pig” theme song. 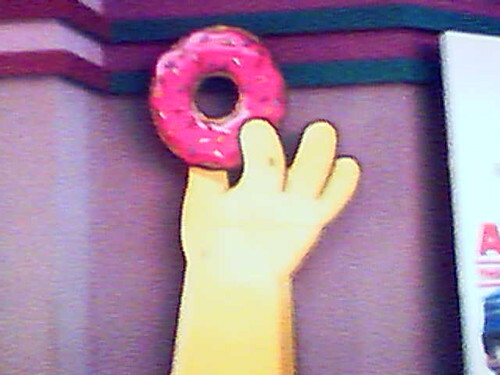 Even though it was used in the promotional commercials, it was still hysterical to hear Homer singing whilst hoisting his new porker pal to the ceiling. The tune’s been stuck replaying in my head since I peeled my shoes off the sticky theater floor and traipsed outside into the sunlight and I don’t mind that ditty whirling around in my brainpan one bit. So let’s all hoist a Duff and toast a successful transition to the big screen. All Hail The Simpsons Movie. I made a discovery yesterday that I want to share. Everyone needs to pay a visit to Garth Marenghi’s DARKPLACE. Here’s a link to the episodes. This UK spoof combines the horror genre and soap operas set in hospitals all done with the worst possible production values and talent. Brilliant! It also throws in a substantial dash of explosions, gunfire and action of the variety viewers who loved the original Starksy and Hutch will appreciate. Viewers with more eclectic tastes will recognize an homage to Lars von Triers “Kingdom”, the UK TV show set in a gloomy, spooky hospital. Stephen King worked an American version of von Triers’ show for television called “Kingdom Hospital”. I found DARKPLACE online and then I found out the SciFi network started airing it as of Friday night. It’s a must see for those who have laughed their way through horrible horror movies for years. This one takes the bloody cake. Parody at its finest. Here’s a snippet of the amazing stilted dialogue from the script of Episode 1. Not really, I’ve already paged Dr. Sanchez who should be here any minute now. Dun, dun, dun – The dramatic prairie dog would be working overtime watching these episodes. 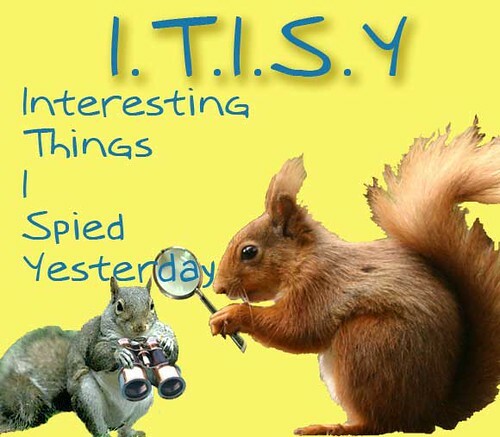 For more, go check out this fan site from the UK. Take this bit of Garth Marenghi wisdom with you as you begin your voyage to … DARKPLACE. Garth Merenghi: I have never exploded. But, I know what it would be like. Don’t ask me how, I just know. I’ve always, just known. If you feel like the recent marketing and fan worship of The Simpsons are inundating your gray matter and leaving it feeling a bit yellow and mushy, here’s some science for you. With a twist. I mean, come on, it is Eric Idle. Brilliant! 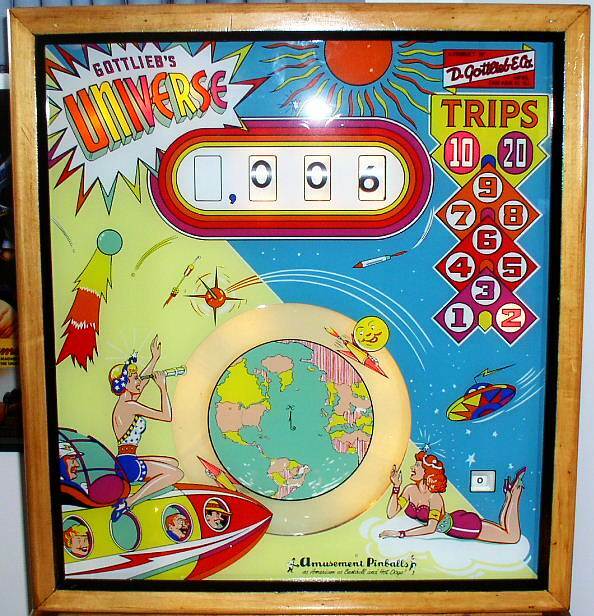 And if you’d like to see more of the fabulous pinball machine pictured above, go here. Here’s a little something to help sate your appetite for the yellow family on this big Simpsons weekend. 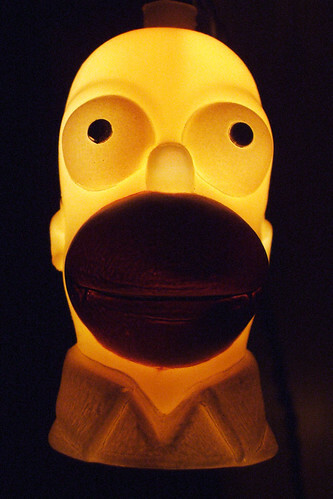 From Stuffmagazine.com, it is a Top 10 list of the Weirdest Stuff Homer Simpson Has Ever Eaten. These culinary mistakes certainly make those giant pink donuts look even tastier. 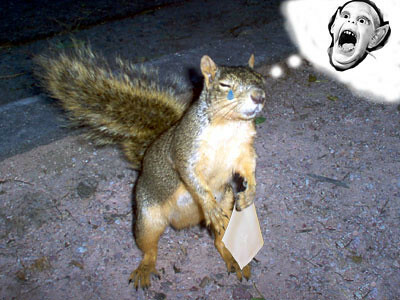 The Squirrel Queen is in mourning this week. I found out the horrible news from Newscoma who heard the word from Cuppa Joe. Drastic news of this sort travels fast, leaving many tears to be shed and cloth to be ripped. The Weekly World News is shutting down. A staple of my life for more than two decades, my source for news about Bat Boy, Bigfoot, Alien invasions, the Loch Ness Monster and so much more will no longer ease my passage through the checkout lines in stores. It won’t be there to comfort me as my cheeks adjust to the chill of the cold porcelain. How will I go on? My love for the rag began so long ago. Working alone late at night at a radio station, I not only read WWN, but I also perused every page of the Memphis Commercial Appeal looking for odd A.P. stories for the radio station’s morning show team to use. There, tucked away at the bottom of a column many pages deep inside the traditional Appeal, I’d find tales of dogs walking hundreds of miles back to their original owners after getting lost during a family vacation or stories of singing birds alerting their owners to a blaze within the home in time to save lives or the odd story about what was recovered from the gastric areas of humans in emergency surgeries just in time to keep them upright and on planet Earth. Then a few weeks later, I would find many of these same stories inside the WWN acting again as filler between the brilliant Dear Dotty and Ed Anger columns. I would alert people to the veracity of many of the stories inside the grocery store tabloid and would often be scoffed at. But I kept those clippings from the Commercial Appeal and showed the doubters the A.P. evidence. It rarely did much to convince the naysayers. I even used WWN to decorate my first apartment. It was in an old home that had been split into a duplex, thus we had a long hallway on our side that went basically nowhere. I used headlines and cover art to create a WWN wallpaper, covering the cheap wood paneling with ink about Bigfoot and Bat Boy art all the way up to the molding just below the 10-foot ceiling. It truly was a decorating masterpiece. Martha would have been very proud. I still have a WWN cover from a few years ago when Bat Boy hunted down Osama Bin Laden. I taped that one to the wall of my office just across from my desk. Whenever I needed writing inspiration, all I had to do was glance up and make eye contact with Bat Boy and the ideas flowed from my fingertips to the keyboard. Magic. Unlike Newscoma, I never sent in a resume, but it certainly would have been a “dream” job to dream up news of that sort. In only a few hours I’ll be sitting in a darkened theater seeing yellow. The Simpsons Movie is my focus today. I’ve waited years. If I had a Dunkin Donuts within driving range, I’d go buy a donut slathered with pink icing just to honor the occasion. And in a perfect world, I’d chase it down with a tall, cold glass of Duff. To hold me over until the local debut from Springfield today, I spent yesterday practicing my movie watching skills by seeing Harry Plopper, er, I mean Harry Potter’s latest trauma. While we were waiting in the lobby to enter the theater, I used my camera phone to snap this giant Simpsons promotional standup. A huge yellow arm and pink donut that captured my attention like no other poster or cardboard cutout lining the lobby walls. As for Potter, it was merely a diversion. I’m no Hogwarts alumnae. I wasn’t standing in line at midnight recently to purchase the latest and last offering from J.K. Rowling. I don’t care if you spoil it for me. Heck I realized during the movie yesterday, I hadn’t even seen the Potter flick that came out before this one. All I have to say about this movie – too much sand, not enough Hagrid. Cowabunga, that Potter kid, he’s no Bart Simpson.